This section provides an overview of what ssis is, and why a developer might want to use it. It should also mention any large subjects within ssis, and link out to the related topics. Since the Documentation for ssis is new, you may need to create initial versions of those related topics. 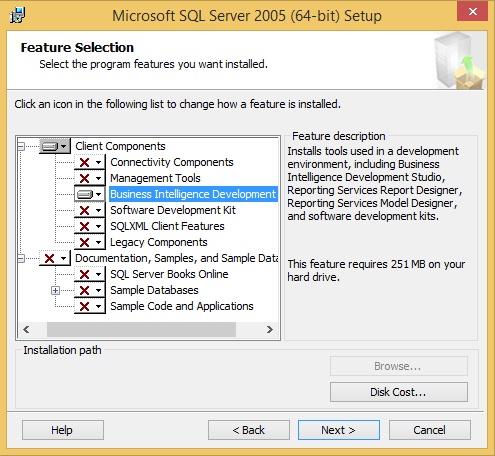 Acquire SQL Server 2005 (x86 or 64 bit) images. "Next" your way through the dialogs until you see see this screen. Continue clicking Next until the installation is complete. You will now have BIDS (Business Intelligence Development Studio) on your machine with the correct project types so that you can create Integration Services, Analysis Services and Reporting Services projects. BIDS uses a Visual Studio 2005 shell.